Easy Pear Salsa – it’s another good one! I am still a huge fan of my favorite Black Bean and Corn Salsa. This year-round delicious pleaser continues to wow crowds whether at a backyard BBQ, sitting poolside, or snuggled onto the couch to watch the Super Bowl. BUT, I now have another fresh tasting salsa recipe that a good friend introduced me to. I could easily devour (and have devoured – sorry Jess!) an entire the bowl if left in front of me. I am now officially adding this Easy Pear Salsa to my list of favorite recipes. The sweetness from the pears, the acid from the lime juice, along with the hot spiciness from the jalapenos is just perfect. Awesome on a tortilla chip or something sweet and spicy to liven up blackened fish or chicken – I’m getting hungry just thinking about it! 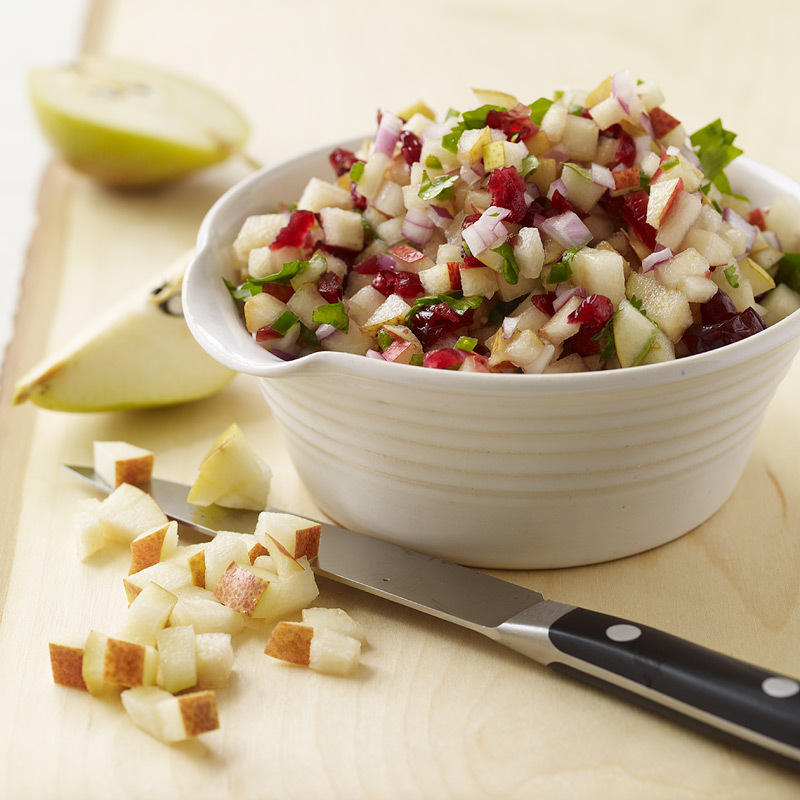 Chop pears, cilantro, jalapeno, red onion, and cranberries. Add to bowl. Toss gently. Add fresh lime juice. Add salt to taste. Gently toss. Awesome with tortilla chips, Triscuits with Brie cheese, fish, blackened chicken or just in a spoon!! Previous PostThe Perfect Place to Call Home (and it’s for sale! )Next PostWhy own a home?